Based on public court filings and Wikileaks documents purporting to be military reports on Guantanamo detainees, the government has apparently created a rather extensive collection of documents for intelligence exploitation comprised of letters between detainees and their families. Federal prisons . . . required Confederate prisoners to adhere to special rules in regard to their letters. 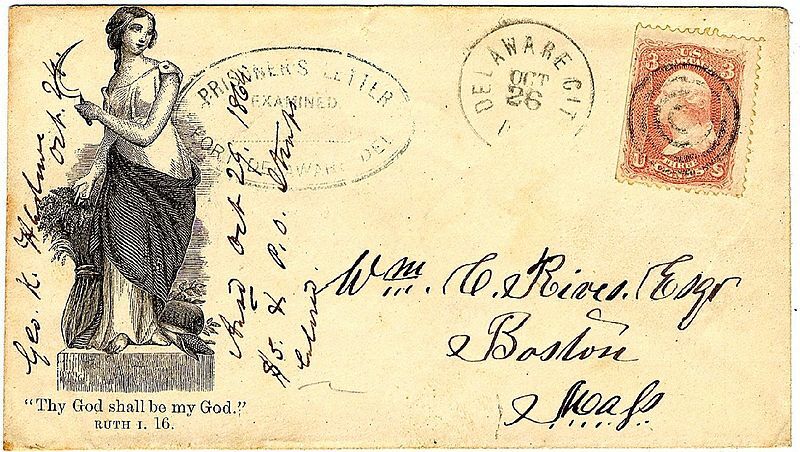 A prisoner's letter had to be enclosed in an unsealed envelope and placed in an outer envelope. It was then sent to a designated location, where the outer envelope was opened, destroyed, and the enclosed letter carefully examined. If approved, the letter was sealed, marked "Examined", and placed in the mail at a nearby post office. This is also consistent with Article 71 of the 1949 Third Geneva Convention which both requires that POWs be allowed to send mail and also contemplates censorship of that mail by the Detaining Power. Prisoners of war shall be allowed to send and receive letters and cards. If the Detaining Power deems it necessary to limit the number of letters and cards sent by each prisoner of war, the said number shall not be less than two letters and four cards monthly . . . . Further limitations may be imposed only if the Protecting Power is satisfied that it would be in the interests of the prisoners of war concerned to do so owing to difficulties of translation caused by the Detaining Power's inability to find sufficient qualified linguists to carry out the necessary censorship. In the case of the GTMO letters, the exploitation of the letters for possible (or at least perceived) intelligence value appears to be remarkably extensive. Some of the conclusions drawn, however, seem like a stretch or of questionable significance. Take Mahmud's letter at the top of this post, for example. 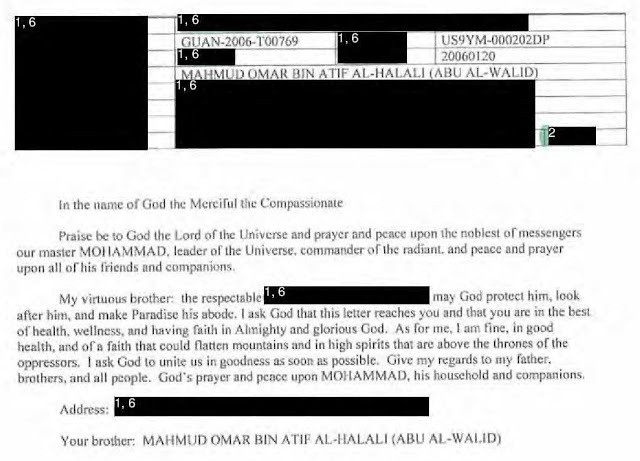 The Wikileaks GTMO report on him at p. 2 states that "through exploitation of a letter he sent home" (same letter, compare GUAN number in footnote 2), the intelligence analysts added "al-Halali" as a additional "alias" of Mahmud. The significance of this new "intelligence" is then immediately undermined in a footnote stating that"[i]nitial research on this alias provided no additional information. Al-Halali is [a] family name more commonly associated with Yemeni citizens." As the report itself notes, Mahmud "claims" to be Yemeni and his father is Yemeni. The name "al-Halali" most likely, therefore, would seem simply to be an indication that his family originally came from Halal, Yemen consistent with the Arabic name conventions in the DIA's own guidance (e.g., Al-Adani means from Aden, Yemen) rather than some nefarious "alias" he accidentally revealed to his captors in a letter home. According to another Wikileaks GTMO report, GUAN-2007-A00595, GUAN-2007-T03659, and GUAN-2007-T04158 are letters between a current GTMO detainee from Yemen named Sabri and a former GTMO detainee who had earlier been repatriated back to Kuwait named Abdul-Aziz. Oddly, this correspondence is listed as a reason for continuing to detain Sabri because Abdul-Aziz allegedly had ties to al-Qaida when Abdul-Aziz was in Afghanistan years ago. It invites the question, of course, if Abdul-Aziz was so dangerous that merely corresponding with him is a reason for continued detention of Sabri, why was Abdul-Aziz allowed to leave GTMO in the first place? It also leaves out the additional information that when Abdul-Aziz was sent back to Kuwait, he was actually charged in Kuwaiti court for belonging to al-Qaeda, but was then acquitted of all charges. Other exploited family letters feel a bit like, well, exploitation. In another Wikileaks GTMO report, for example, document GUAN-2006-A02327 consists of a letter from a detainee's wife writing to her detained husband "discussing financial difficulties." The intelligence analysts speculate coldly that this personal letter could be relevant to whether the detainee might have years earlier received money from someone alleged to be involved in terrorism. Despite its potential shortcomings as a source of intelligence and its sometimes unseemly characteristics, this database of correspondence could actually one day become a unique set of archives for historians studying the GTMO detentions -- if, and when, GTMO becomes solely a part of the past.